When I used to visit this stretch of Olympic Blvd in East LA, that many, including myself have referred to as the taco mecca, I would feast on 50 cent tacos from El Capitan, get my hot sauce fix from King Taco, carnitas fix at Antojitos Denise, and take in one of the many taco trucks that can be found on both sides of the 5 freeway . 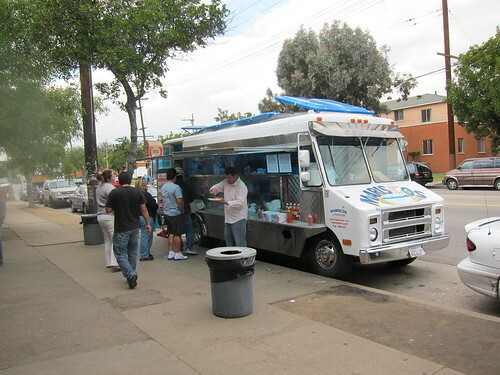 Then I would head west on Olympic and see the mariscos trucks, and the crowds of people, and wonder what could possibly be that good. 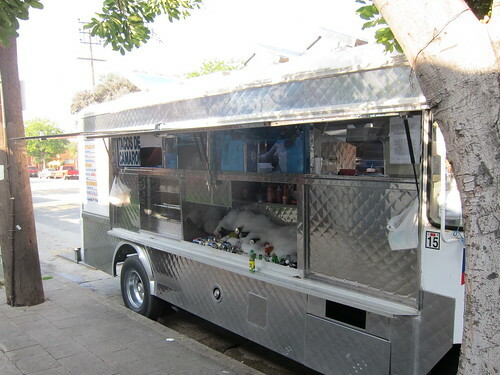 Then last September during the 30 taco trucks in 30 days I tried Mariscos Jalisco, and I found out . The post didn’t make it to the blog however, because it did not meet my quota of three tacos; something I realized later in the day and ended up settling for the cardboard chicharrones at Valentino tacos in Venice. But Mariscos Jalisco made a big impression. The shrimp dorado taco was amazing and unlike anything I had tried before; the crispness of the shell, the warm dense shrimp, the coolness of the avocado and salsa, it was all a new taco eating experience. So I went back to the 3000 block of E Olympic Blvd in East LA to try Mariscos Jalisco again and compare them to their closest competitor, Mariscos 4 Vientos. 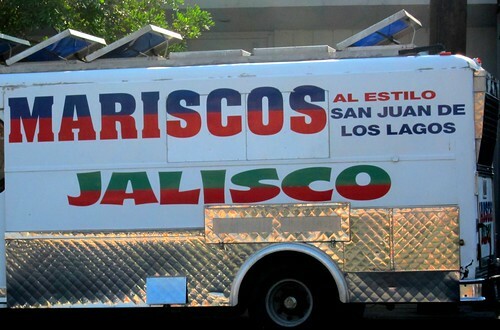 Both trucks park within 50 yards of each other, with Maricos 4 Vientos parking in front of their restaurant of the same name. Both trucks serve delicious hard shell shrimp tacos covered in a tomato salsa broth and slices of avocado. I went to Mariscos Jalisco first and ordered one shrimp taco. 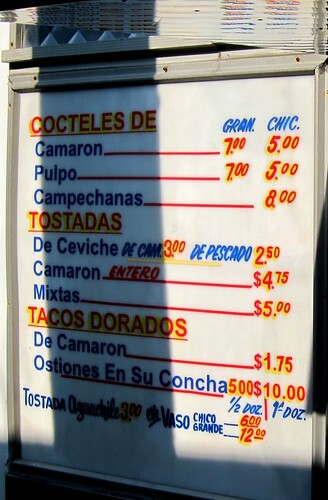 I wanted to try their aguachile but they were out (I think the girl said they only had it on the weekends) . The taco was just as I remembered with lots of interesting textures and flavor. The crunch of the hard shell taco, the warm shrimp, and the coolness of the slices of avocado and salsa had me dancing in the streets. What a beauty this taco is. I wanted to order a couple more but staying true to my mission I walked down to Mariscos 4 Vientos hoping they were up to the challenge. There were more people at Mariscos 4 Vientos but the line moved quickly, and soon enough I had my taco. 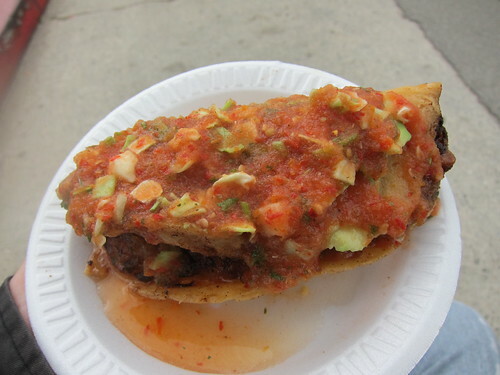 The crispy dorado was very similar to Mariscos Jalisco with the warm shrimp, slices of avocado, and bits of cabbage. There were subtle differences though. This taco was spicy, and not just a little spicy, but enough that a couple saltine crackers were needed. 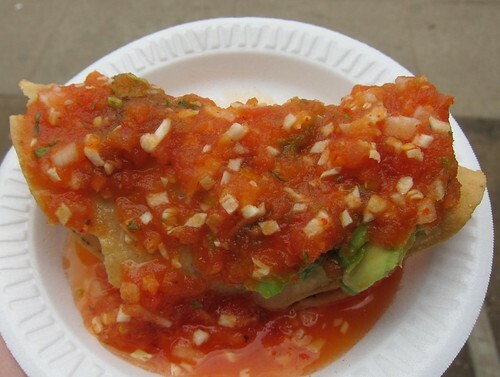 Also, the sauce was more watery with chunks of tomato, compared to Mariscos Jalisco’s thicker, more consistent creation. The shrimp inside both tacos was very good. I was pretty sure which taco I preferred but I needed to confim my choice ,so I walked back to Mariscos Jalisco and ordered another shrimp taco. After the first bite I was convinced, it was Mariscos Jalisco. As much as I like spice with my tacos, with the Mariscos Jalisco it was all about flavor. Damn, Mariscos Jaliscos better than Mariscos 4 Vientos? Guess I have to try Mariscos Jaliscos. I love these shrimp dorado tacos but I can't find myself enjoying any more than 2. It's a bit filling and the texture and the heaviness bother me after a bit. I find myself thinking... "One is amazing, two is pretty damn good, three... I don't want anymore." So I end up mixing it up with a tostada or something. Better to head on over to Mariscos Jaliscos to try those shrimp tacos. Never had one before. So far, the length of my taco experience is Taco Bell. About time to widen the Taco horizon. 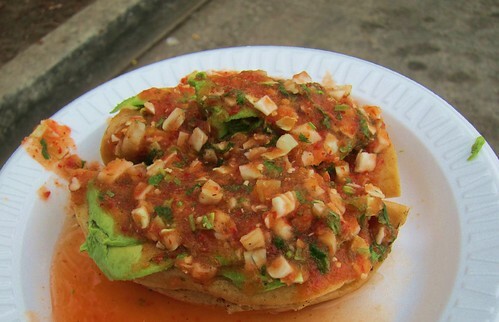 Judging just by the pictures, Mariscos Jalisco looks more appetizing. Just wish there was a picture of you literally dancing in the streets with a shrimp taco in hand. Seriously, some of the BEST!!! tacos around, grew up in E.L.A. so I know my tacos - WUT? Tried them both yesterday. Mariscos Jalisco was better, for sure. Didn't find the Mariscos 4 Vientos spicy at all, though?